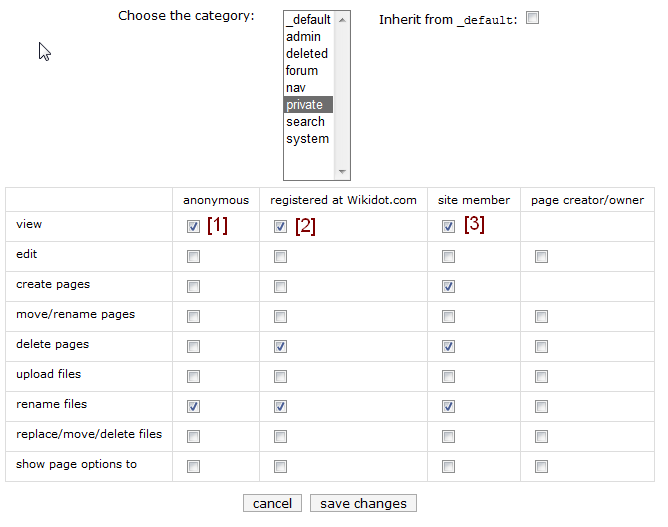 If for example, I deselect the "site member" checkbox for 'rename files', it is automatically deselected for "anonymous" and "registered at Wikidot.com" as well. This works as expected. However, for the row titled 'view', deselecting a checkbox affects all checkboxes down and to the left of that checkbox. It should only affect the checkboxes on the left, in the same row. To reproduce: Set up your permissions as shown in the picture below. Thanks :) Seems to work as it should now.